Thymeless Bath and Oils specializes in handmade soaps, lotions, scrubs and a few other items such as candles, linen sprays and roll-on scents, all of which are made from all-natural ingredients that are good for you. I recently received a sample pack for review in participation with a Karma Media Campaign, and I love both the scents and how lovely each item is. Soy Brick ~ Fresh Cut Tulip: The Soy Bricks work in any wax warmer (Scentsy, melting pot, tart warmer). You simply break off a small portion of the brick and place it in the warmer. As it melts, it makes the room smell wonderful. The Fresh Cut Tulip is a very nice, lightly floral scent, and I'm LOVING it! Linen/Room Spray ~ Olive Blossom: This spray can be used on your bed linens or around the house to help freshen the room and provide a pampered feeling. The Olive Blossom scent was a really nice scent for our home because it isn't too girly, but still provides a really nice and enjoyable scent (I have to be careful on household scents as I have 2 boys and a husband - I'm really outnumbered, and they are ok with some girly scents, but when it comes to the bedroom and where they sleep, too girly is just too much!). I found it really relaxing and it made me feel... happy and content! Roll-On Perfume ~ Lavender and Rosehips: This is a wonderful (and natural, so it is good for you) alternative to traditional perfumes. Roll-on perfume comes in a small vial-type glass container with a roller-ball. It is EASY to use, and a little goes a long way (I'm guessing because it is scented using essential oils instead of man-made scents). I was really impressed with the Lavender and Rosehips scent. It is a very pleasant floral scent that smells like a really expensive perfume. I was not overwhelmed by the scent and it is a great scent for special occasions and daily wear. 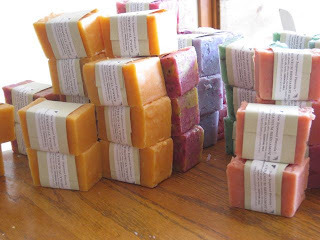 Bar Soap ~ Lilac and Raspberry: These bar soaps are made using palm oil, olive oil, coconut oil, rice bran oil, castor oil, shea butter, silk, herbs and fragrance oils. The result is a wonderfully nourishing soap that leaves your skin clean and soft. I've had a love/hate relationship with many bar soaps, and this is the first one that I've absolutely fallen in love with! The scent is light and AMAZING, it doesn't dry my skin out, and I enjoy using it in the shower. If you were to ask me which of the scents I loved the best, I honestly wouldn't be able to pick one, and the great news is that I loved them ALL! Usually I'm really picky with scented items, and will find I like only one, not the case with the Thymeless scents. They really were all wonderful. 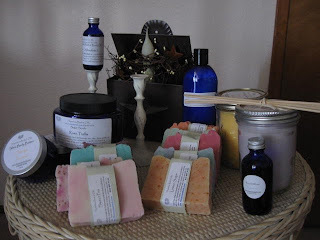 The Thymeless Bath and Oils products have become a favorite, and I highly recommend them. They would be great for gifts too. Each comes very nicely packaged and can be mixed and matched. WHO CAN ENTER: A parent or guardian of a child age 8 to 11 together as a family team. WHAT IT'S ABOUT: How your family makes mealtime fun while making good meal choices. WHAT YOU CAN DO: Cook up a winning video and answer some cool questions together about how your family makes mealtime fun while making good meal choices. WHAT YOU COULD WIN: You could win a trip to the London 2012 Olympic Games and help whip up some fun food for Happy Meal! Do you and your kids love to cook together using wholesome ingredients? Well, here’s good news for your family – our new “Happy Meal Chefs” contest will give two winning parent and child teams the opportunity to help McDonald’s executive chef Dan Coudreaut in the creation and testing of new, nutrition-minded Happy Meal choices. That’s right! Your child could win an apprenticeship with McDonald’s executive chef and help his team whip up new fun and goodness in the Happy Meal! Adding to the excitement, ten finalists will win a trip to the London 2012 Olympic Games as part of the Global Champions of Play program where they will join kids from around the world to celebrate balanced eating and fun play. From now through April 18, parents or legal guardians with kids (ages 8-11) are eligible to enter on the Happy Meal Chefs contest website. Working as family teams, all you have to do is answer a brief questionnaire and submit a short online video that creatively showcases your mealtime. The contest is part of our new Happy Meal campaign that aims to make nutrition fun for kids. In addition to the contest, the campaign includes new TV advertisements featuring menu items from recommended food groups found in the new Happy Meal, which automatically includes apple slices and a kid-size fry. These are the first ads that support our nutrition commitment to promote a nutrition and/or lifestyle message in 100 percent of its national communications to kids. The ads introduce new characters – each with a story that celebrates kids’ aspirations – who achieve their goals with the help of balanced eating and active play. NO PURCHASE NECESSARY. Open to US residents 18 yrs+ who are parent/legal guardian of a child 8-11 yrs. Contest ends 4/18/12. Subject to Official Rules. See Official Rules at https://happymealchefs.mcdonalds.com/rules info, deadlines & complete details. Void where prohibited. What are you waiting for! Get cooking and have some fun. :) If you created your own Happy Meal, what would foods would you include? *Disclosure: I found out about this fun opportunity as part of the Family Arches program, and am posting about the contest in the hopes of getting some Happy Meal Coupons to share with friends, family and YOU, my readers! Calling all bloggers!! 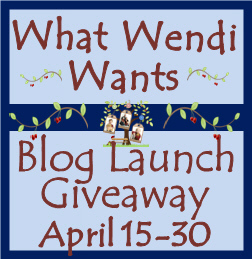 I'm having a huge giveaway, co-hosted by Day By Day in Our World, Life With Levi, and Sunshine and Sippy Cups to launch my new blog: What Wendi Wants, and I'd love to invite you to participate! So far I've got over $514 in prizes (Skylanders Xbox 360 game, Pure Pearls Freshwater Pearl Bracelet, Perplexus Game, Aromafloria Spa Set), and will be mailing out 2 of the prizes myself. YOU can have one free link (Facebook, Twitter or Google +) in exchange for posting a really quick info post about the giveaway to help get the word out (feel free to right click and save the button), and then post giveaway on your blog on April 15 for the duration of the giveaway. Links will be removed for those who don't post the giveaway. Additional links are $1.00 each ($2.00 if you want all 3 possible links), payable to wbarker@hotmail.com via Paypal. For the payment description, please simply put your blog name. If there are enough people who pay for links, I will add a cash prize or another prize. Links will be added in the order they are received. The giveaway will last from April 15th - April 30th, and will be open to the US and Canada. I'm loving my new Nature's Sleep Queen Vitex2 Memory Foam pillow, and one lucky reader will have the chance to see for yourself exactly what I'm talking about! Haven't seen the review? Check it out here. There are two ways for you to get your own brand new pillow: head over to their site and buy one, or come enter the giveaway below - Natures Sleep has generously allowed me to give away one of their Vitex2 Memory Foam Queen Pillows (just like mine). If you don't see the Rafflecopter Entry Form below, click on the post title above to go directly to the post itself, and if that still does not work, please press F5 to reload the page. Click Read More to show the Rafflecopter Form. For years I've had trouble sleeping because my jaw would ache. I needed to sleep in one position and keep my jaw propped by an extra pillow. I very rarely slept through the night, simply because my aching jaw would wake me up. 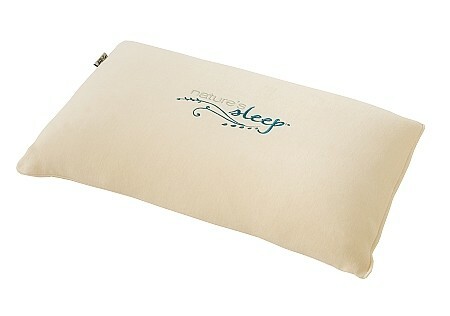 Until I slept on my new Nature's Sleep Vitex2 Memory Foam Pillow. I think I had the best night of sleep EVER! Not only did my jaw NOT ache, but I slept so soundly. The Queen Vitex2 Memory Foam Pillow is the perfect firmness for me, but if you don't like a somewhat firm pillow, you can look at some of their other pillows: Faux Down (softer, huggable), Viscolite (softish, memory foam), Visco Memory Foam Contour (moderate density). I'm loving my new pillow, and so is our 2 year old. He sneaks in and tries to nap on my pillow whenever he can. The website is easy to use and provides a lot of information. Each pillow type is well described and covers firmness and what the pillow is best for (sleeping on your back, side, stomache, supporting breathing/snoring, etc). The pillow price already includes the tax (so what you see is what you pay), free shipping, and comes with a 3 year limited warranty. You can also purchase high quality memory foam mattresses on their site as well. I learned that Nature's Sleep is an eco-friendly company, taking extra efforts to continually make their carbon footprint smaller, and doing their best to protect and conserve global resources. This endears them in my mind even more. There are two ways for you to get your own brand new pillow: head over to their site and buy one, or come enter my giveaway - Natures Sleep has generously allowed me to give away one of their Vitex2 Memory Foam Queen Pillows (just like mine). Enter HERE. Edition Reviewed: Queen ViTEX2 Memory Foam Pillow- Review sample received courtesy of Nature's Sleep, many thanks for sending me a sample to review! About Us Our mission is simple: to provide the best products and service to our customers at the lowest prices possible. We take great pride in our company, our commitment to customer service and in the products we sell. Our online store is designed to provide you with a safe and secure environment to browse our product catalog.